369-209 Underfrequency Protection in Autonomous Island Power Systems: The Case Study of Crete. 369-078 Asset Not Performing - What to Do Next? 369-191 A Model For Electrical Discharge and Leakage Current Development on High Voltage Insulators. 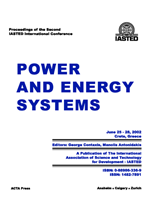 This publication covers the following topics: Power System Planning and New Developments; Power System Stability and Control; Power Quality; Renewable Energy and Technologies; Generation; Distribution; HIV Transmission and Switching; Variable Structure Control for Power Systems; and Variable Speed Drives and Industrial Applications.